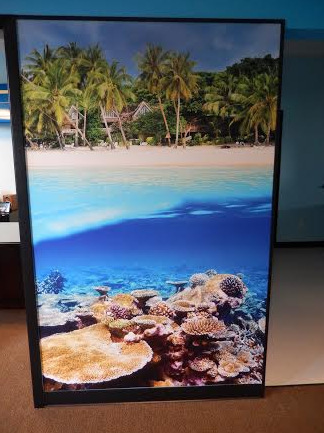 At Blue Barrel Signs, we stand by the quality of the vinyl films we use for our window, wall, and floor graphics. This is because we turn to manufacturers like Avery Dennison, Oracal, and 3M for our vinyl. You make the most of the unused surfaces in, on, and around your venue with window, wall, and floor signs and graphics. For general awareness purposes, custom graphics can simply showcase your corporate logo. Or, you can take it to the next level by displaying promotions, short messages, or other offerings. Window graphics advertise, brand and inform! There are static cling and vinyl adhesive varieties of window graphics. Static cling is ideally suited for sales or other events that require temporary signage. Full vinyl window cling is terrific if you want to obscure a window during construction. Vinyl adhesive signs are the better choice for more long term campaigns. Your message can be printed on the back or the face of the adhesive marker. 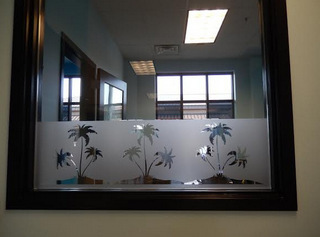 Additionally, based on your situation and preference, graphics are installed to the outside or inside of your window. Window graphics include clear window decals, perforated vinyl decals that allow you to still see outside, and store window graphics. Also referred to as wall graphics and digitally printed wallpaper, wall murals can feature your mottos, dedicated promotional images, logos, and slogans. Text and graphics are digitally printed directly to the vinyl that is to be installed. Wall graphics are most often found in dental and medical waiting areas to put patients at ease, nonprofits wanting to display their mission statement, restaurants interested in creating an ambiance that matches their cuisine, offices that want to affordably change their interior décor, and many other places. Wall graphics affordable and vibrant! Floor graphics are an effective and inexpensive way to market your brand. With the widespread use of smart phones, the new line of sight has moved to the floor as people swipe their screens as they walk around. 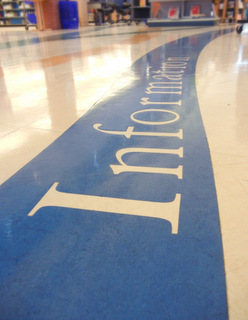 Organizations are using floor graphics to highlight their brand in their lobby areas. And, trade show exhibitors utilize these markers to direct attendees to their booth. There are several types of floor graphics, including carpet, concrete, customized, directional, hardwood, removable, smooth, slip resistant, and tile floor graphics. Vinyl graphics can be applied to virtually any nonporous surface, including your car. Turn the otherwise unused surfaces of your store into marketing tools by using window, wall, and floor graphics. Blue Barrel Signs proudly serves the communities of Lapine, Madras, Prineville, Sisters, Redmond, and the rest of Central Oregon from our headquarters in Bend, Oregon. For a free consultation and estimate on window, wall, and floor graphics for your organization, contact us today.